Ugandan international ace Alex Kakuba yesterday (Wednesday) completed his move to Armenia top flight club Loris FC on a 2yrs contract for a fee believed to be in the range of 400,000 usd. The silky left back has been clubless since partying ways with Greek side PAS Giannina last December and has been working around the clock to find a new home. Thank you God for this new opportunity in my life. I cannot wait to start off.” he said Kakuba after sealing the deal. The former Proline FC left back was immediately handed jersey number 3 at his new club. Lori Football Club is currently fifth on the log of ten teams with 30 points collected from 20 games. Kakuba becomes the fourth Ugandan player to feauture in the Armenia premier League after Eugene Ssepuya, Noah Babadi Kasule and Dan Muzeeyi Serunkuuma. He has previously featured for Esperança Lagos, Desportivo De Agueda, Sporting Covilha, Estoril Praia and CD Feirense all in Portugal. 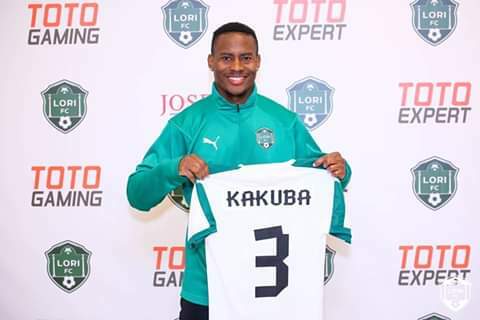 All the best Alex Kakuba at your new home.